As a new rabbinical student at the Jewish Theological Seminary in the late 1990s I found myself being the go to techie for my fellow students who wanted the mobile luach installed on their pocket data organizer. Penticon’s Luach quickly became the killer app for anyone in the Jewish professional world. The dean of the rabbinical school at the time, Rabbi William Lebeau, told the senior class that they could not be ordained as a rabbi from the Seminary unless they had a PDA with Luach installed. “Jewish professionals have long relied on the luach in planning community programming and observances,” Morris explained. “Reform Jewish professionals had no calendar resource geared specifically toward us; our only option was to consult a luach from another denomination and then rework each day's observance based on Reform custom and liturgy. Reform Luach is intended to assist Reform rabbis, cantors, and prayer leaders in planning worship and synagogue observances.” Reform Luach is now in beta version and drawing its data primarily from the HebCal.com website. As you say, Google calendar has special support for the Jewish calendar, but in most calendar apps it is possible to add additional calendars that are maintained elsewhere. 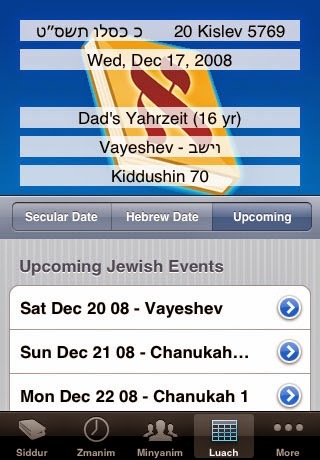 Via https://your-calendar.com you can obtain a link to a Jewish calendar, that you can then add to the calendar application you are already using. The addition to Google calendars is great but I still want user entries repeating by Hebrew date like the old Penticon. I'm with Anonymous. Including the Hebrew calendar within Google calendar is a good first step, but until it's possible to schedule repeating Hebrew dates (e.g. for yahrzeits), the new feature is of limited use.